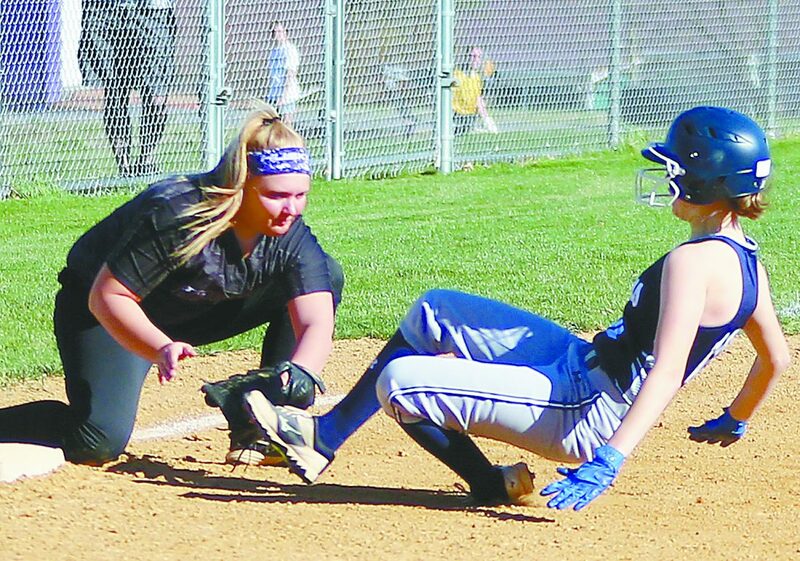 Mifflin County’s Morgan Weston, left, lowers the tag on Chambersburg’s Alyssa Wenger sliding into third base in fourth-inning action Tuesday in Lewistown. 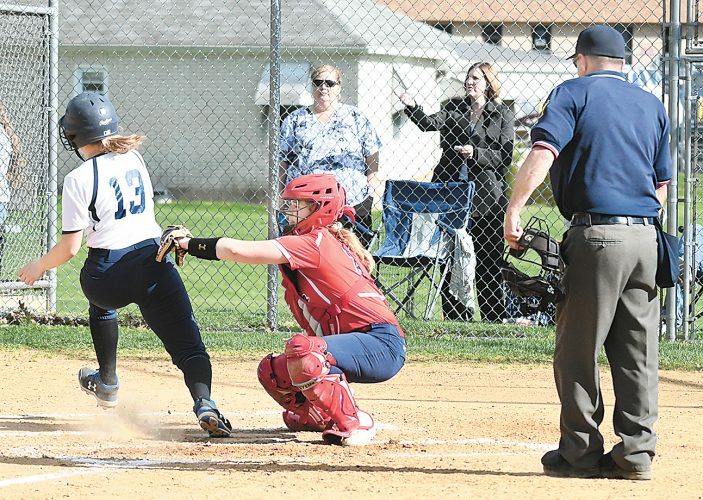 LEWISTOWN — Chambersburg pitcher McKenzie Stake limited a struggling Mifflin County offense to four hits in a 3-0 Mid-Penn Commonwealth victory for the Trojans on Tuesday afternoon. 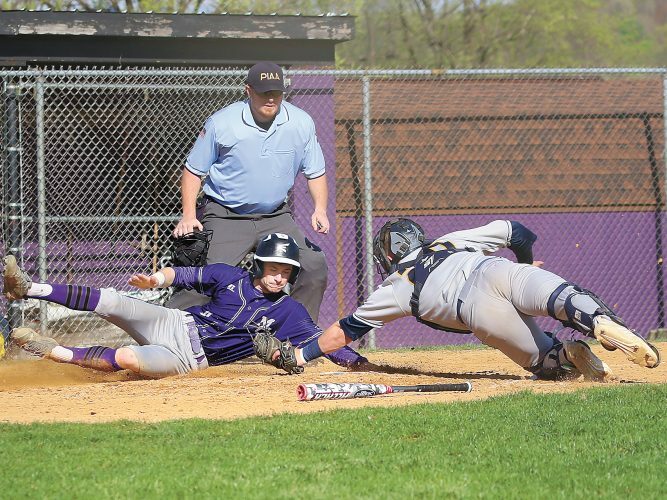 Mifflin County, no-hit by Central Dauphin on Thursday, hasn’t scored a run in its last two games. The Trojans (5-0, 5-0) got all their runs in the fourth inning. Alyssa Brechbill started things off taking the 0-2 pitch for the solo homer to left. “It was a drop ball that held up a bit and the wind today was bad. The homer was wind-aided. 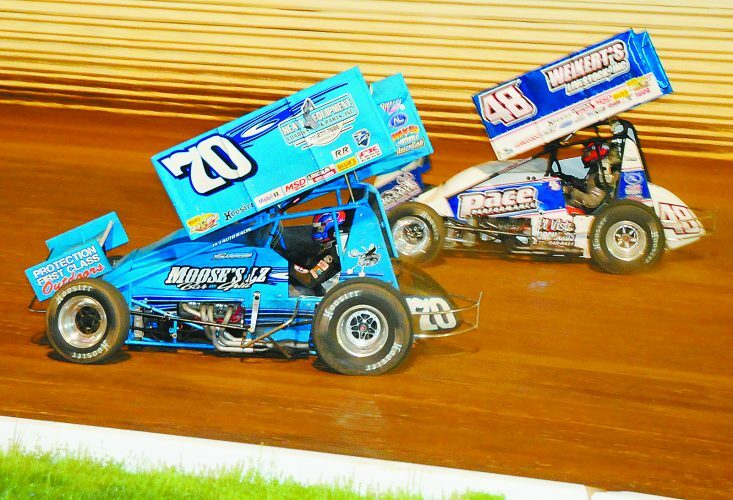 If the wind isn’t blowing like that, it might have stayed in the park,” McCurdy said. Brooklyn Miller followed with a walk and Alyssa Wenger singled, moving courtesy runner Erin Patillo to second. Patillo scored on an error and Wenger came home from third on the passed ball. Devanie Condrack took the loss for the Huskies but pitched a solid game. The Husky sophomore gave up only four hits, one earned run while fanning eight and walking three. Stake picked up the victory allowing only four hits, striking out three with one walk. Mifflin County (4-2, 3-2) didn’t get its first hit until the fifth inning when Olivia Ahern singled to right. Alyssa Schnell reached on an error with Ahern getting tagged out at second. Morgan Weston singled to put runners on first and second but a ground out ended the scoring opportunity. The Huskies put together a two-out rally in the seventh when Chloe Fitzgerald singled and went to second on a passed ball. Schnell singled to right putting runners on first and third but a popup to second ended any Mifflin County hopes of a comeback. Morningstar and Cassidy Wilson played lights-out defense in left and center, respectively, covering a ton of ground. Morningstar had four putouts and Wilson three. 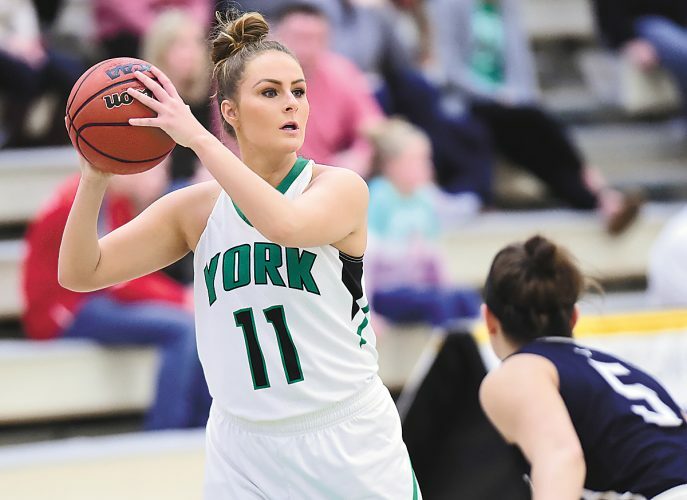 “Jade gets a good jump on the ball and Cass does as well. When the ball is hit to center or left field you feel pretty confident with those two out there because you know one of them is going to get to it,” McCurdy said. Wenger led conference-leading Chambersburg with two hits. Mifflin County hosts Cumberland Valley in Mid-Penn action today at 4:15 p.m.
“Cumberland Valley doesn’t have the pitching they’ve had in the past, but it doesn’t matter who we are playing. We need to come out and play our game and that’s what I hope they can do tomorrow,” McCurdy said. WP: McKenzie Stake. LP: Devanie Condrack. SO: Stake 3 (C); Condrack 8 (MC). BB: Stake (C); Condrack 3 (MC). HR: Alyssa Brechbill (C). MH: Alyssa Wenger 2-3 (C). RBI: Brechbill (C).